You may have heard of people who have “inherited” or “genetic” hypercholesterolemia or very high cholesterol. When you truly have the genetic kind, you have a defect on chromosome 19 – unfortunately too many people are walking around saying that high cholesterol runs in the family and that they are all predisposed to hypercholesterolemia. This really is not true at all, most times they are just eating a poor diet causing lipid readings to be out of kilter. As you can see – it is a genetic defect and this is generally picked up in children, not middle age. So what we often refer to as ‘genetically inherited’ raised cholesterol is nothing of the kind. This particular genetic variant is in fact quite rare. So relax if you have raised cholesterol, there is MUCH more to this subject than meets the eye, but I can only touch on it here. In fact hyperlipidemia on its own (raised blood fats or LDL) is actually ‘relative’. What does ‘raised’ mean anyway – who decides what’s healthy and what’s dangerous or how high is too high? The drug companies? It could mean raised according to someone’s decision to call a particular reading ‘high’ in order to sell you a drug, when in fact for you personally, this reading could be completely normal and benign. Like having blue eyes or brown eyes. 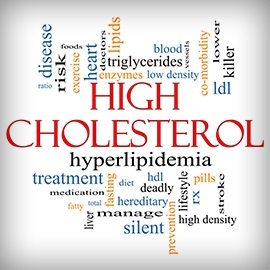 The thing to be concerned about is not the LDL (so-called ‘bad’ cholesterol’) but rather your triglyceride levels – and especially triglycerides in relation to HDL levels. When these blood fats are raised, and your so-called ‘good’ cholesterol – HDL – is low, that’s when one needs to be concerned. At the same time, there is no need for drug therapy here, this requires lifestyle and dietary modification! No drug can adequately deal with this – it’s what goes into your mouth that makes the difference. You DO want to address these levels as they are key players in diabetes, cardiovascular disease, stroke, obesity, Alzheimer’s, hypertension etc and this is done with your knife and fork, and how you live. You may be unaware of this finding, but taking statin drugs to lower cholesterol actually raises your risk of diabetes, and bring a world of misery with them. I do not believe they are the answer for a second and I’d be the last person on this earth to ever take a statin drug. Diabetes is a serious disease, and with studies showing your chances of developing diabetes on statins rise by a whopping 50% – you’d have to be insane to swop one relatively benign condition (high LDL) for a serious life-threatening disease like diabetes (see study here). As always in all serious disease, check with your qualified healthcare provider first.